I love, love, love eggs and bacon for breakfast. But things done right take time. I don’t always have the time for bacon and eggs and breakfast extraordinaire. But I always have eggs. I brown some spices. I saute garlic/peppers/greens. I scramble some eggs with lime. I add in last night’s protein. I add salt, fresh pepper, etc. I decide there must be onions on the side. Obviously, there has to be bacon on the side. Suddenly, breakfast becomes a full meal in need of full prep. Don’t get me wrong, these breakfasts always turn out fantastical. But sometimes you want the zip without the trip. …with/without the actual bacon, sides, extras, and hassle. Unless you want all that. Then look up a different recipe. Warm bacon grease in pan. Crack eggs directly in heated bacon grease. Fry. If you wanna cook em faster, use spatula to break the yolks. Draw diving lines in the eggs so you can flip them when the edges start to rise. Throw fried eggs in bowl. 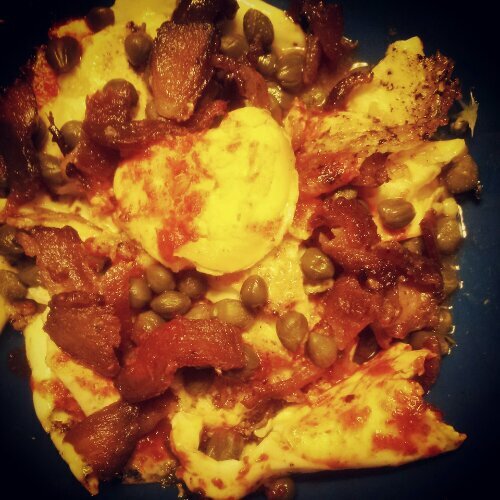 Top with capers and hot sauce. « Ford Makes Your Bacon Wrapped Car Dreams Come True?